For other uses, see Middle Kingdom. The Middle Kingdom of Egypt (also known as The Period of Reunification) is the period in the history of ancient Egypt following a period of political division known as the First Intermediate Period. The Middle Kingdom lasted from around 2050 BC to around 1710 BC, stretching from the reunification of Egypt under the reign of Mentuhotep II of the Eleventh Dynasty to the end of the Twelfth Dynasty. The Eleventh Dynasty ruled from Thebes and the Twelfth Dynasty ruled from el-Lisht. Some scholars also include the Thirteenth Dynasty of Egypt wholly into this period as well, in which case the Middle Kingdom would finish around 1650, while others only include it until Merneferre Ay around 1700 BC, last king of this dynasty to be attested in both Upper and Lower Egypt. During the Middle Kingdom period, Osiris became the most important deity in popular religion. The Middle Kingdom was followed by the Second Intermediate Period of Egypt, another period of division that involved foreign invasions of the country by the Hyksos of West Asia. After the collapse of the Old Kingdom, Egypt entered a period of weak Pharaonic power and decentralization called the First Intermediate Period. Towards the end of this period, two rival dynasties, known in Egyptology as the Tenth and Eleventh, fought for power over the entire country. The Theban Eleventh Dynasty only ruled southern Egypt from the first cataract to the Tenth Nome of Upper Egypt. To the north, Lower Egypt was ruled by the rival Tenth Dynasty from Herakleopolis. The struggle was to be concluded by Mentuhotep II, who ascended the Theban throne in 2055 BC. During Mentuhotep II's fourteenth regnal year, he took advantage of a revolt in the Thinite Nome to launch an attack on Herakleopolis, which met little resistance. After toppling the last rulers of the Tenth Dynasty, Mentuhotep began consolidating his power over all Egypt, a process which he finished by his 39th regnal year. For this reason, Mentuhotep II is regarded as the founder of the Middle Kingdom. Mentuhotep II commanded petty campaigns south as far as the Second Cataract in Nubia, which had gained its independence during the First Intermediate Period. He also restored Egyptian hegemony over the Sinai region, which had been lost to Egypt since the end of the Old Kingdom. To consolidate his authority, he restored the cult of the ruler, depicting himself as a god in his own lifetime, wearing the headdresses of Amun and Min. He died after a reign of 51 years, and passed the throne to his son, Mentuhotep III. Mentuhotep III reigned for only twelve years, during which he continued consolidating Theban rule over the whole of Egypt, building a series of forts in the eastern Delta region to secure Egypt against threats from Asia. He also sent the first expedition to Punt during the Middle Kingdom, by means of ships constructed at the end of Wadi Hammamat, on the Red Sea. Mentuhotep III was succeeded by Mentuhotep IV, whose name significantly is omitted from all ancient Egyptian king lists. The Turin Papyrus claims that after Mentuhotep III came "seven kingless years". Despite this absence, his reign is attested from a few inscriptions in Wadi Hammamat that record expeditions to the Red Sea coast and to quarry stone for the royal monuments. The leader of this expedition was his vizier Amenemhat, who is widely assumed to be the future pharaoh Amenemhet I, the first king of the Twelfth Dynasty. Mentuhotep IV's absence from the king lists has prompted the theory that Amenemhet I usurped his throne. While there are no contemporary accounts of this struggle, certain circumstantial evidence may point to the existence of a civil war at the end of the 11th dynasty. Inscriptions left by one Nehry, the Haty-a of Hermopolis, suggest that he was attacked at a place called Shedyet-sha by the forces of the reigning king, but his forces prevailed. Khnumhotep I, an official under Amenemhet I, claims to have participated in a flotilla of 20 ships to pacify Upper Egypt. Donald Redford has suggested these events should be interpreted as evidence of open war between two dynastic claimants. What is certain is that, however he came to power, Amenemhet I was not of royal birth. The head of a statue of Senusret I. From the Twelfth Dynasty onwards, pharaohs often kept well-trained standing armies, which included Nubian contingents. These formed the basis of larger forces which were raised for defence against invasion, or for expeditions up the Nile or across the Sinai. However, the Middle Kingdom was basically defensive in its military strategy, with fortifications built at the First Cataract of the Nile, in the Delta and across the Sinai Isthmus. Early in his reign, Amenemhet I was compelled to campaign in the Delta region, which had not received as much attention as upper Egypt during the 11th Dynasty. In addition, he strengthened defenses between Egypt and Asia, building the Walls of the Ruler in the East Delta region. Perhaps in response to this perpetual unrest, Amenemhat I built a new capital for Egypt in the north, known as Amenemhet Itj Tawy, or Amenemhet, Seizer of the Two Lands. The location of this capital is unknown, but is presumably near the city's necropolis, the present-day el-Lisht. Like Mentuhotep II, Amenemhet bolstered his claim to authority with propaganda. In particular, the Prophecy of Neferty dates to about this time, which purports to be an oracle of an Old Kingdom priest, who predicts a king, Amenemhet I, arising from the far south of Egypt to restore the kingdom after centuries of chaos. Senusret III was a warrior-king, often taking to the field himself. In his sixth year, he re-dredged an Old Kingdom canal around the first cataract to facilitate travel to Upper Nubia. He used this to launch a series of brutal campaigns in Nubia in his sixth, eighth, tenth, and sixteenth years. After his victories, Senusret built a series of massive forts throughout the country to establish the formal boundary between Egyptian conquests and unconquered Nubia at Semna. The personnel of these forts were charged to send frequent reports to the capital on the movements and activities of the local Medjay natives, some of which survive, revealing how tightly the Egyptians intended to control the southern border. Medjay were not allowed north of the border by ship, nor could they enter by land with their flocks, but they were permitted to travel to local forts in order to trade. After this, Senusret sent one more campaign in his 19th year, but turned back due to abnormally low Nile levels, which endangered his ships. One of Senusret's soldiers also records a campaign into Palestine, perhaps against Shechem, the only reference to a military campaign against a location in Palestine from the entirety of Middle Kingdom literature. A rare etched carnelian bead excavated in Egypt, and thought to have been imported from the Indus Valley Civilization through Mesopotamia, in an example of Egypt-Mesopotamia relations. Abydos tomb 197, Late Middle Kingdom. Now in Petrie Museum ref. UC30334, London. Domestically, Senusret has been given credit for an administrative reform which put more power in the hands of appointees of the central government, instead of regional authorities. Egypt was divided into three waret, or administrative divisions: North, South, and Head of the South (perhaps Lower Egypt, most of Upper Egypt, and the nomes of the original Theban kingdom during the war with Herakleopolis, respectively). Each region was administrated by a Reporter, Second Reporter, some kind of council (the Djadjat), and a staff of minor officials and scribes. The power of the Nomarchs seems to drop off permanently during his reign, which has been taken to indicate that the central government had finally suppressed them, though there is no record that Senusret ever took direct action against them. Senusret III had a lasting legacy as a warrior Pharaoh. His name was Hellenized by later Greek historians as Sesostris, a name which was then given to a conflation of Senusret and several New Kingdom warrior pharaohs. In Nubia, Senusret was worshiped as a patron God by Egyptian settlers. The duration of his reign remains something of an open question. His son Amenemhet III began reigning after Senusret's 19th regnal year, which has been widely considered Senusret's highest attested date. However, a reference to a year 39 on a fragment found in the construction debris of Senusret's mortuary temple has suggested the possibility of a long coregency with his son. The reign of Amenemhat III was the height of Middle Kingdom economic prosperity. His reign is remarkable for the degree to which Egypt exploited its resources. Mining camps in the Sinai, which had previously been used only by intermittent expeditions, were operated on a semi-permanent basis, as evidenced by the construction of houses, walls, and even local cemeteries. There are 25 separate references to mining expeditions in the Sinai, and four to expeditions in wadi Hammamat, one of which had over 2,000 workers. Amenemhet reinforced his father's defenses in Nubia and continued the Faiyum land reclamation system. After a reign of 45 years, Amenemhet III was succeeded by Amenemhet IV, whose nine-year reign is poorly attested. Clearly by this time, dynastic power began to weaken, for which several explanations have been proposed. Contemporary records of the Nile flood levels indicate that the end of the reign of Amenemhet III was dry, and crop failures may have helped to destabilize the dynasty. Further, Amenemhet III had an inordinately long reign, which tends to create succession problems. The latter argument perhaps explains why Amenemhet IV was succeeded by Sobekneferu, the first historically attested female king of Egypt. Sobekneferu ruled no more than four years, and as she apparently had no heirs, when she died the Twelfth Dynasty came to a sudden end as did the Golden Age of the Middle Kingdom. A kneeling statue of Sobekhotep V, one of the pharaohs from the declining years of the Middle Kingdom. After the death of Sobeknefru, the throne may have passed to Sekhemre Khutawy Sobekhotep, though in older studies Wegaf, who had previously been the Great Overseer of Troops, was thought to have reigned next. Beginning with this reign, Egypt was ruled by a series of ephemeral kings for about ten to fifteen years. Ancient Egyptian sources regard these as the first kings of the Thirteenth Dynasty, though the term dynasty is misleading, as most kings of the thirteenth dynasty were not related. The names of these short-lived kings are attested on a few monuments and graffiti, and their succession order is only known from the Turin Canon, although even this is not fully trusted. After the initial dynastic chaos, a series of longer reigning, better attested kings ruled for about fifty to eighty years. The strongest king of this period, Neferhotep I, ruled for eleven years and maintained effective control of Upper Egypt, Nubia, and the Delta, with the possible exceptions of Xois and Avaris. Neferhotep I was even recognized as the suzerain of the ruler of Byblos, indicating that the Thirteenth Dynasty was able to retain much of the power of the Twelfth Dynasty, at least up to his reign. At some point during the 13th dynasty, Xois and Avaris began governing themselves, the rulers of Xois being the Fourteenth Dynasty, and the Asiatic rulers of Avaris being the Hyksos of the Fifteenth Dynasty. According to Manetho, this latter revolt occurred during the reign of Neferhotep's successor, Sobekhotep IV, though there is no archaeological evidence. Sobekhotep IV was succeeded by the short reign of Sobekhotep V, who was followed by Wahibre Ibiau, then Merneferre Ai. Wahibre Ibiau ruled ten years, and Merneferre Ai ruled for twenty three years, the longest of any Thirteenth Dynasty king, but neither of these two kings left as many attestations as either Neferhotep or Sobekhotep IV. Despite this, they both seem to have held at least parts of lower Egypt. After Merneferre Ai, however, no king left his name on any object found outside the south. This begins the final portion of the thirteenth dynasty, when southern kings continue to reign over Upper Egypt, but when the unity of Egypt fully disintegrated, the Middle Kingdom gave way to the Second Intermediate Period. When the Eleventh Dynasty reunified Egypt it had to create a centralized administration such as had not existed in Egypt since the downfall of the Old Kingdom government. To do this, it appointed people to positions which had fallen out of use in the decentralized First Intermediate Period. Highest among these was the Vizier. The vizier was the chief minister for the king, handling all the day-to-day business of government in the king's place. This was a monumental task, therefore it would often be split into two positions, a vizier of the north, and a vizier of the south. It is uncertain how often this occurred during the Middle Kingdom, but Senusret I clearly had two simultaneously functioning viziers. Other positions were inherited from the provincial form of government at Thebes used by the Eleventh Dynasty before the reunification of Egypt. The Overseer of Sealed Goods became the country's treasurer, and the Overseer of the Estate became the King's chief steward. These three positions and the Scribe of the Royal Document, probably the king's personal scribe, appear to be the most important posts of the central government, judging by the monument count of those in these positions. Beside this, many Old Kingdom posts which had lost their original meaning and become mere honorifics were brought back into the central government. Only high-ranking officials could claim the title Member of the Elite, which had been applied liberally during the First Intermediate Period. This basic form of administration continued throughout the Middle Kingdom, though there is some evidence for a major reform of the central government under Senusret III. Records from his reign indicate that Upper and Lower Egypt were divided into separate waret and governed by separate administrators. Administrative documents and private stele indicate a proliferation of new bureaucratic titles around this time, which have been taken as evidence of a larger central government. Governance of the royal residence was moved into a separate division of government. The military was placed under the control of a chief general. However, it is possible that these titles and positions were much older, and simply were not recorded on funerary stele due to religious conventions. Clay model of a Middle Kingdom house. Musée du Louvre. Decentralization during the First Intermediate Period left the individual Egyptian provinces, or Nomes, under the control of powerful families who held the hereditary title of Great Chief of the Nome, or Nomarch. This position developed during the Fifth and Sixth Dynasties, when the various powers of Old Kingdom provincial officials began to be exercised by a single individual. At roughly this time, the provincial aristocracy began building elaborate tombs for themselves, which have been taken as evidence of the wealth and power which these rulers had acquired as Nomarchs. By the end of the First Intermediate Period, some nomarchs ruled their nomes as minor potentates, such as the nomarch Nehry of Hermopolis, who dated inscriptions by his own regnal year. When the Eleventh Dynasty came to power, it was necessary to subdue the power of the Nomarchs if Egypt was to be reunified under a central government. The first major steps towards that end took place under Amenemhet I. Amenemhet made the city, not the nome, the center of administration, and only the haty-a, or mayor, of the larger cities would be permitted to carry the title of Nomarch. The title of Nomarch continued to be used until the reign of Senusret III, as did the elaborate tombs indicative of their power, after which they suddenly disappear. This has been interpreted several ways. Traditionally, it has been believed that Senusret III took some action to suppress the nomarch families during his reign. Recently, other interpretations have been proposed. Detlef Franke has argued that Senusret II adopted a policy of educating the sons of nomarchs in the capital and appointing them to government posts. In this way, many provincial families may have been bled dry of scions. Also, while the title of Great Overlord of the Nome disappeared, other distinctive titles of the nomarchs remained. During the First Intermediate Period, individuals holding the title of Great Overlord also often held the title of Overseer of Priests. In the late Middle Kingdom, there exist families holding the titles of mayor and overseer of priests as hereditary possessions. Therefore, it has been argued that the great nomarch families were never subdued, but were simply absorbed into the Pharaonic administration of the country. While it is true that the large tombs indicative of nomarchs disappear at the end of the twelfth dynasty, grand royal tombs also disappear soon thereafter due to general instability surrounding the decline of the Middle Kingdom. and I set each thing firmly in its place. Throughout the history of ancient Egypt, the annual inundation of the Nile River was relied upon to fertilize the land surrounding it. This was essential for the agriculture and production of food. There is evidence that the collapse of the previous Old Kingdom may have been due in part to low flood levels, resulting in famine. This trend appears to have been reversed during the early years of the Middle Kingdom, with relatively high water levels recorded for much of this era, with an average inundation of 19 meters above its non-flood levels. The years of repeated high inundation levels correspond to the most prosperous period of the Middle Kingdom, which occurred during the reign of Amenemhat III. This seems to be confirmed in some of the literature of the period, such as in the Instructions of Amenemhat, where the king tells his son how agriculture prospered under his reign. After the reunification of Egypt in the Middle Kingdom, the kings of the Eleventh and Twelfth Dynasties were able to turn their focus back to art. In the Eleventh Dynasty, the kings had their monuments made in a style influenced by the Memphite models of the Fifth and early Sixth Dynasty. During this time, the pre-unification Theban relief style all but disappeared. These changes had an ideological purpose, as the Eleventh Dynasty kings were establishing a centralized state after the First Intermediate Period, and returning to the political ideals of the Old Kingdom. In the early Twelfth Dynasty, the artwork had a uniformity of style due to the influence of the royal workshops. It was at this point that the quality of artistic production for the elite members of society reached a high point that was never surpassed, although it was equaled in other periods. Egypt prospered in the late Twelfth Dynasty, and this was reflected in the quality of the materials used for royal and private monuments. 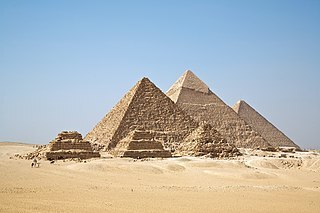 The kings of the Twelfth Dynasty were buried in pyramid complexes based on those of the Fifth and Sixth Dynasties. In the Old Kingdom, these were made of stone bricks, but the Middle Kingdom kings chose to have theirs made of mud bricks and finished with a casing of Tura limestone. Private tombs, such as those found in Thebes, usually consisted of a long passage cut into rock, with a small chamber at the end. These tended to have little or no decoration. Stone box sarcophagi with both flat and vaulted lids were manufactured in the Middle Kingdom, as a continuation of the Old Kingdom tradition. The motifs on these were more varied and of higher artistic quality than that of any sarcophagi produced before and after the Middle Kingdom. Additionally, funerary stelae developed in regard to images and iconography. They continued to show the deceased seated in front of a table of offerings, and began to include the deceased's wife and other family members. Towards the end of the Middle Kingdom, there was a change to the art pieces placed in non-royal tombs. The amount of wooden tomb models decreased drastically, and they were replaced by small faience models of food. Magic wands and rods, models of protective animals, and fertility figures began to be buried with the dead. Additionally, the number of statues and funerary stelae increased, but their quality decreased. In the late Twelfth Dynasty, coffins with interior decorations became rare, and the decorations on the outside became more elaborate. The rishi-coffin made its first appearance during this time. Made of wood or cartonnage, the coffin was in the shape of a body wrapped in linen, wearing a beaded collar and a funerary mask. There were also changes to the art form of stelae in the Middle Kingdom. During this time, round-topped stelae developed out of the rectangular form of previous periods. Many examples of both of these types come from these period; excavation at Abydos yielded over 2000 private stelae, ranging from excellent works to crude objects, although very few belonged to the elite. Additionally, classic royal commemorative stelae were first found in this period. These took the form of a round-topped stelae, and they were used to mark boundaries. 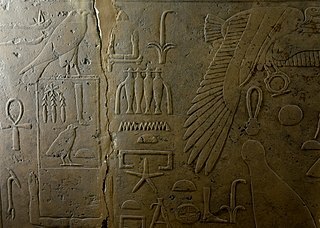 For example, Senusret III used them to mark the boundary between Egypt and Nubia. Because of the prosperity of this period, the lower elite were able to commission statues and stelae for themselves, although these were of poorer artistic quality. Those who commissioned nonroyal stelae had the ultimate goal of eternal existence. This goal was communicated with the specific placement of information on the stone slabs similar to royal stelae (the owner's image, offering formula, inscriptions of names, lineage and titles). In the first half of the Twelfth Dynasty, proportions of the human figure returned to the traditional Memphite style of the Fifth and early Sixth Dynasties. Male figures had broad shoulders, a low small of the back, and thick muscular limbs. Females had slender figures, a higher small of the back and no musculature. In this period, sketches for the production of statues and reliefs were laid out on a squared grid, a new guide system. Since this system contained a greater number of lines, it allowed more body parts to be marked. Standing figures were composed of eighteen squares from the feet to the hairline. Seated figures were made of fourteen squares between their feet and hairline, accounting for the horizontal thigh and knee. The black granite seated statue of king Amenemhat III to the right is a perfect example of male proportions and the squared grid system at this period. Most royal statues, such as this one, would serve as representations of the king's power. The quality of Egyptian statuary reached its peak in the Middle Kingdom. Royal statues combined both elegance and strength in a manner that was seldom seen after this period. A popular form of statuary during this time was that of the sphinx. During this period, sphinxes appeared in pairs, and were recumbent, with human faces, and a lion's mane and ears. An example would be the diorite sphinx of Senusret III. One of the innovations in sculpture that occurred during the Middle Kingdom was the block statue, which would continue to be popular through to the Ptolemaic Kingdom almost 2,000 years later. Block statues consist of a man squatting with his knees drawn up to his chest and his arms folded on top his knees. Often, these men are wearing a "wide cloak" that reduces the body of the figure to a simple block-like shape. The surface of the garment or "wide cloak" allowed space for inscriptions. Most of the detail is reserved for the head of the individual being depicted. In some instances the modeling of the limbs has been retained by the sculptor. There are two basic types of block statues: ones with the feet completely covered by the cloak and ones with the feet uncovered. This statue to the right represents a woman from the top echelon of society and demonstrates characteristics of Middle Kingdom art. The heavy tripartite wig frames the broad face and passes behind the ears, thus giving the impression of forcing them forward. They are large in keeping with the ancient Egyptian ideal of beauty; the same ideal required small breasts, and also in this respect the sculpture is no exception. Whereas the natural curve of the eyebrows dips towards the root of the nose, the artificial eyebrows in low relief are absolutely straight above the inner corners of the eyes, a feature which places the bust early in Dynasty XII. Around 1900 BC these artificial eyebrows, too, began to follow the natural curve and dipped toward the nose. In the later Twelfth Dynasty, proportions of the human figure changed. These changes survived throughout the Thirteenth to Seventeenth Dynasties. Male figures had smaller heads in proportion the rest of the body, narrow shoulders and waists, a high small of the back, and no muscled limbs. Female figures had these proportions more to an extreme with narrower shoulders and waists, slender limbs and a higher small of the back in order to keep a distinction between male and female measurements. Richard B. Parkinson and Ludwig D. Morenz write that ancient Egyptian literature—narrowly defined as belles-lettres ("beautiful writing")—were not recorded in written form until the early Twelfth Dynasty. Old Kingdom texts served mainly to maintain the divine cults, preserve souls in the afterlife, and document accounts for practical uses in daily life. It was not until the Middle Kingdom that texts were written for the purpose of entertainment and intellectual curiosity. Parkinson and Morenz also speculate that written works of the Middle Kingdom were transcriptions of the oral literature of the Old Kingdom. It is known that some oral poetry was preserved in later writing; for example, litter-bearers' songs were preserved as written verses in tomb inscriptions of the Old Kingdom. It is also thought that the growth of the middle class and a growth in the number of scribes needed for the expanded bureaucracy under Senusret II helped spur the development of Middle Kingdom literature. Later ancient Egyptians considered the literature from this time as "classic". Stories such as the Tale of the Shipwrecked Sailor and the Story of Sinuhe were composed during this period, and were popular enough to be widely copied afterwards. Many philosophical works were also created at this time, including the Dispute between a man and his Ba where an unhappy man converses with his soul, The Satire of the Trades in which the role of the scribe is praised above all other jobs, and the magic tales supposedly told to the Old Kingdom pharaoh Khufu in the Westcar Papyrus. ^ a b c Redford. (1992) p. 71. ^ Gardiner. (1964) p. 124. ^ Redford. (1992) p. 72. ^ a b c Gardiner. (1964) p. 125. ^ p5. 'The Collins Encyclopedia of Military History', (4th edition, 1993), Dupuy & Dupuy. ^ Arnold. (1991) p. 20. ^ Arnold. (1991) p. 14. ^ Gardiner. (1964) p. 128. ^ a b Gardiner. (1964) p. 129. ^ Murnane. (1977) p. 5. ^ Murnane. (1977) p. 7. ^ Gardiner. (1964) p. 138. ^ Gardiner. (1964) p. 136. ^ Gardiner. (1964) p. 135. ^ Robins, Gay (2008). The Art of Ancient Egypt (Rev. ed.). Cambridge, Mass. : Harvard University Press. p. 90. ISBN 9780674030657. OCLC 191732570. ^ a b Robins (2008), p. 109. ^ Robins (2008), p. 96. ^ "Pyramid | Grove Art". doi:10.1093/gao/9781884446054.article.t070190. Retrieved 2018-12-03. ^ "Thebes (i) | Grove Art". doi:10.1093/gao/9781884446054.article.t084413. Retrieved 2018-12-03. ^ "Sarcophagus | Grove Art". doi:10.1093/gao/9781884446054.article.t075996. Retrieved 2018-12-03. ^ Robins (2008), p. 102. ^ Robins (2008), p. 114. ^ Robins (2008), p. 115. ^ a b "Stele | Grove Art". doi:10.1093/gao/9781884446054.article.t081249. Retrieved 2018-12-03. ^ "Abydos | Grove Art". doi:10.1093/gao/9781884446054.article.t000298. Retrieved 2018-12-03. ^ Robins (2008), p. 110. ^ Oppenheim, Adela; Arnold, Dorothea; Arnold, Dieter; Yamamoto, Kei (2015). Ancient Egypt transformed: the Middle Kingdom. New York: The Metropolitan Museum of Art. p. 36. ISBN 9781588395641. OCLC 909251373. ^ a b Robins (2008), pp. 106, 107. ^ Robins (2008), pp. 107, 108. ^ "Statue of Amenemhat III". hermitagemuseum. Retrieved 6 December 2018. ^ Robins (2008), pp. 112, 113. ^ a b "Sphinx | Grove Art". doi:10.1093/gao/9781884446054.article.t080560. Retrieved 2018-12-03. ^ "Taharqa | Grove Art". doi:10.1093/gao/9781884446054.article.t083009. Retrieved 2018-12-03. ^ Bothmer, Bernard (1974). Brief Guide to the Department of Egyptian and Classical Art. Brooklyn, NY: Brooklyn Museum. p. 36. ^ Robins (2008), p. 118. ^ Parkinson 2002, pp. 45–46, 49–50, 55–56; Morenz 2003, p. 102; see also Simpson 1972, pp. 3–6 and Erman 2005, pp. xxiv–xxv. Arnold, Dorothea (1991). "Amenemhet I and the Early Twelfth Dynasty at Thebes". Metropolitan Museum Journal. 26. doi:10.2307/1512902. Bell, Barbara (1975). "Climate and the History of Egypt: The Middle Kingdom". American Journal of Archaeology. Archaeological Institute of America. 79 (3): 223–269. JSTOR 503481. Erman, Adolf (2005). Ancient Egyptian Literature: A Collection of Poems, Narratives and Manuals of Instructions from the Third and Second Millennia BC. Translated by Aylward M. Blackman. New York: Kegan Paul. ISBN 0-7103-0964-3. Grajetzki, Wolfram (2006). The Middle Kingdom of Ancient Egypt. Gerald Duckworth & Co. Ltd. ISBN 0-7156-3435-6. Habachi, Labib (1963). "King Nebhepetre Menthuhotep: his monuments, place in history, deification and unusual representations in form of gods". Annales du Service des Antiquités de l'Égypte. 19: 16–52. Hayes, William (1953). "Notes on the Government of Egypt in the Late Middle Kingdom". Journal of Near Eastern Studies. 12: 31–39. doi:10.1086/371108. Murnane, William J. (1977). Ancient Egyptian Coregencies. Studies in Ancient Oriental Civilization. 40. The Oriental Institute of the University of Chicago. ISBN 0-918986-03-6. Parkinson, R. B. (2002). Poetry and Culture in Middle Kingdom Egypt: A Dark Side to Perfection. London: Continuum. ISBN 0-8264-5637-5. Shaw, Ian; Nicholson, Paul (1995). The Dictionary of Ancient Egypt. Thames and Hudson. Simpson, William Kelly (1972). The Literature of Ancient Egypt: An Anthology of Stories, Instructions, and Poetry. translations by R.O. Faulkner, Edward F. Wente, Jr., and William Kelly Simpson. New Haven and London: Yale University Press. ISBN 0-300-01482-1. Teeter, Emily (1994). "Egyptian Art". Art Institute of Chicago Museum Studies. The Art Institute of Chicago. 20 (1): 14–31. doi:10.2307/4112949. JSTOR 4112949. Trigger, B.; Kemp, Barry; O'Connor, David; Lloyd, Alan (1983). Ancient Egypt: A Social History. Cambridge University Press. Wegner, Josef (1996). "The Nature and Chronology of the Senwosret III–Amenemhat III Regnal Succession: Some Considerations Based on New Evidence from the Mortuary Temple of Senwosret III at Abydos". Journal of Near Eastern Studies. 55: 249–279. doi:10.1086/373863. Allen, James P. Middle Egyptian Literature: Eight Literary Works of the Middle Kingdom. Cambridge, UK: Cambridge University Press, 2015. Bourriau, Janine. Pharaohs and Mortals: Egyptian Art in the Middle Kingdom. Cambridge, UK: Fitzwilliam Museum, 1988. Grajetzki, Wolfgang. The Middle Kingdom of Ancient Egypt: History, Archaeology and Society. Bristol, UK: Golden House, 2006. Kemp, Barry J. Ancient Egypt: Anatomy of a Civilization. 2d ed. London: Routledge, 2006. Oppenheim, Adela, Dieter Arnold, and Kei Yamamoto. Ancient Egypt Transformed: The Middle Kingdom. New York: Metropolitan Museum of Art, 2015. Parkinson, Richard B. Voices From Ancient Egypt: An Anthology of Middle Kingdom Writings. Norman: University of Oklahoma Press, 1991. --. Poetry and Culture in Middle Kingdom Egypt: A Dark Side to Perfection. London: Continuum, 2002. Szpakowska, Kasia. Daily Life in Ancient Egypt. Oxford: Blackwell, 2008. Wendrich, Willeke, ed. Egyptian Archaeology. Chichester, UK: Wiley-Blackwell, 2010. Amenemhat III, also spelled Amenemhet III, was a pharaoh of the Twelfth Dynasty of Egypt. He ruled from c. 1860 BC to c. 1814 BC, the highest known date being found in a papyrus dated to Regnal Year 46, I Akhet 22 of his rule. His reign is regarded as the golden age of the Middle Kingdom. He may have had a long coregency with his father, Senusret III. The Twelfth Dynasty of ancient Egypt, is often combined with the Eleventh, Thirteenth and Fourteenth Dynasties under the group title Middle Kingdom. Nebhepetre Mentuhotep II was a Pharaoh of the 11th Dynasty who reigned for 51 years. Around his 39th year on the throne he reunited Egypt, thus ending the First Intermediate Period. Consequently, he is considered the first pharaoh of the Middle Kingdom. Amenemhat I, also Amenemhet I and the hellenized form Ammenemes, was the first ruler of the Twelfth Dynasty, the dynasty considered to be the golden-age of the Middle Kingdom of Egypt. He ruled from 1991 BC to 1962 BC. Senusret I, also anglicized as Sesostris I and Senwosret I, was the second pharaoh of the Twelfth Dynasty of Egypt. He ruled from 1971 BC to 1926 BC, and was one of the most powerful kings of this Dynasty. He was the son of Amenemhat I. Senusret I was known by his prenomen, Kheperkare, which means "the Ka of Re is created." Khakheperre Senusret II was the fourth pharaoh of the Twelfth Dynasty of Egypt. He ruled from 1897 BC to 1878 BC. His pyramid was constructed at El-Lahun. Senusret II took a great deal of interest in the Faiyum oasis region and began work on an extensive irrigation system from Bahr Yussef through to Lake Moeris through the construction of a dike at El-Lahun and the addition of a network of drainage canals. The purpose of his project was to increase the amount of cultivable land in that area. The importance of this project is emphasized by Senusret II's decision to move the royal necropolis from Dahshur to El-Lahun where he built his pyramid. This location would remain the political capital for the 12th and 13th Dynasties of Egypt. The king also established the first known workers' quarter in the nearby town of Senusrethotep (Kahun). Khakaure Senusret III was a pharaoh of Egypt. He ruled from 1878 BC to 1839 BC during a time of great power and prosperity, and was the fifth king of the Twelfth Dynasty of the Middle Kingdom. He was a great pharaoh of the Twelfth Dynasty and is considered to be, perhaps, the most powerful Egyptian ruler of the dynasty. Consequently, he is regarded as one of the sources for the legend about Sesostris. His military campaigns gave rise to an era of peace and economic prosperity that reduced the power of regional rulers and led to a revival in craftwork, trade, and urban development. Senusret III was among the few Egyptian kings who were deified and honored with a cult during their own lifetime. Beni Hasan is an Ancient Egyptian cemetery site. It is located approximately 20 kilometers (12 mi) to the south of modern-day Minya in the region known as Middle Egypt, the area between Asyut and Memphis. The Ancient Egyptian official Meketre was chancellor and high steward during the reign of Mentuhotep II, Mentuhotep III and perhaps Amenemhat I, during the Middle Kingdom. Segerseni was an ancient Egyptian or Nubian chieftain of Nubia, likely reigning concurrently with the end of the 11th and beginning of the 12th Dynasty during the early Middle Kingdom. Khnumhotep I was an ancient Egyptian Great Chief of the Oryx nome during the reign of Pharaoh Amenemhat I of the 12th Dynasty, Middle Kingdom. The Oryx nome was one of the 42 nomoi in ancient Egypt. More precisely, it was the 16th nome of Upper Egypt. It was named after the Scimitar oryx, and was roughly located in the territories surrounding the modern city of Minya in Middle Egypt. The Hare nome, also called the Hermopolite nome was one of the 42 nomoi in ancient Egypt; more precisely, it was the 15th nome of Upper Egypt. Djefaihapi was an ancient Egyptian official during the reign of pharaoh Senusret I of the 12th Dynasty. In literature, his name is found written in many other variants such as Hepzefa, Hapidjefa, Hapdjefai, and Djefaihap.